I would have liked to write a preview of the Prison Break season premier earlier this week or even this morning if the opportunity had presented itself, but things didn't work out that way. Fox has without question the worst PR department of any of the networks, and never sent me the screener I asked for last week. I asked for Prison Break, but ended up with a second Terminator screener instead. Perhaps that's for the better because I wasn't looking forward to another season of PB anyway. I apologize for not getting that done. It's nothing personal against the people, maybe Fox just doesn't know how to run a PR outfit. Without exception everyone I've talked to over there has been nice and helpful, it just takes 2-3 tries to get a single response out of anyone and in one case, it took 11 days to get a reply. Is it any wonder that I was only able to get somebody to agree to send me a screener for Prison Break last week and that it didn't get here before the premier? That's no way to run a business if you ask me, but I suppose being the number one network in the ratings means you can be unprofessional to the critics you rely on to help sell your shows to the viewers and get away with it. But as I said, I wasn't really looking forward to seeing Prison Break return this year anyway. The first season had a creative premise that sounded terrible on paper but was executed magnificently in reality. Now obviously this wasn't the first series set in a prison, Oz on HBO comes to mind and I'm sure there have been many others. But how do you stretch an escape across an entire season, and how to you keep it going in successive seasons? Well first you've got to get sent to prison to begin with, a place you've already scoped out with a plan already carefully constructed with a fair chance of success not just "within the show" but on in the writers room. They pulled that off better than anyone could have hoped and for what it's worth, Prison Break was the best new show of that season without question. But how do you sustain it? The second season was confused and all over the place with characters always running from someone or something and from one week to the next without any place to run to. Being chased by the FBI is nothing new to television nor is a supposedly upstanding law enfrocement officer turning out to be a drug addicted murderer. It's hard enough to get any single series premise right but to create one that works and then throw it out in favor of something completely different was a risk I wouldn't have taken, one that cost this show credibilty. Everything good about season one was abandoned. Every relationship, every location, every obstacle, everything was gone. The intricate escape plan was replaced by luck and chance. Perhaps realizing their mistake, the producers returned our merry bunch to prison in the third season which only made things worse. Although at first it was new and interesting -- this prison didn't have guards on the inside or locked cells which from what I understand isn't necessarily inaccurate -- it tired once the moment-to-moment jeopardy fell away. Once we understood who the new threats were and what the goal was -- same as the first -- it lost its luster. The last few moments of season two where we're lead to believe that much of what was happening in the show was being orchestrated by some shadowy figures to test Michael, to prepare him for something or that they had some unknown plans for him and wanted him in this specific Panamanian prison, was never paid off. It was the only thing that made me want to continue watching the series after the tragedy that was season two. The lame overplayed business about "the company" has been used so many times in television and the movies that it's practically a cliche. There's nothing scary or threatening about a company full of mercenaries playing their little war games, in this day and age it practically defines ordinary. 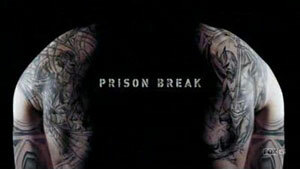 I think that Prison Break above most "modern era" series is proof of the feasibility of entertaining "one-off" shows. You can take finite concepts, play them out, and then move on to something else. On the other hand it's also proof that you can't reinvent yourself every single season and expect people to stick with you. As I sit and watch the fourth season premier on national TV along with the rest of you, it's pretty clear that every new season of Prison Break is an entirely new show with the same old characters doing the same thing for the third consecutive year: boring the hell out of me. If this season doesn't turn things around, I won't be watching a fifth, or the rumored spin-off either. This is PB's very last chance to capture ligthening in a bottle for a second time. Make the best of it fellas. Kind of makes you wonder...why not do each season with different characters/ different "prisons"? The coolest Prison show? The UK's "The Prisoner". I never got to see more than two ep.s of Oz and just found it depressing and soap opera-ish. Small sample for sure. I very much enjoyed the first season, and... well, I watched the rest of the series. I will continue to watch the series regardless, but it will never be as good. Tewa's idea for different characters is a good one, but not the type of premise that has been tested in (non-reality) American series as far as I know. The premiere was interesting... we'll see how the season goes.